This is the perfect dinner salad for a hot summer day. It utilizes that last half of the baguette you had for dinner last night... or the night before. It can be made with any type of bread, in fact... or a mixture of breads. I've even frozen leftover bread to save for panzanella or Italian Bread Soup. You can add other things you like, or leave out some of the following ingredients, if you are offended by them. I have seen recipes using blanched green beans, mushrooms, cucumbers, asparagus, or any number of veggie combinations. So, mix it up. Get creative. 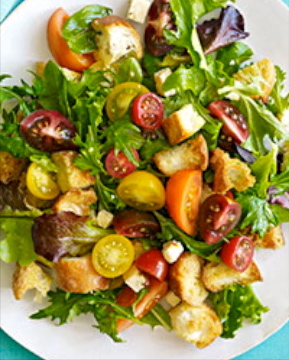 Try different types and colors of tomatoes. Remember those lovely vegetables you bought at the Farmers' Market last week? You haven't cooked them yet, have you? They are languishing in the bottom drawer of your fridge as their nutrients slowly slip away... Toss them in! 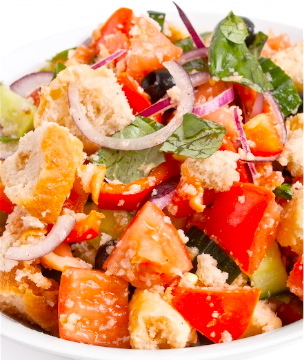 Place bread, tomato, onion, peppers, hearts of palm, pepperoncini and olives in a large bowl. In a small bowl or food processor, mash anchovy fillets. Add basil, lemon zest and juice, vinegar, oil and brining liquid. Blend, then season with salt and pepper. Dress salad with dressing, tossing in greens at the last minute and enjoy. Dinner in a hurry... in and out of the kitchen, quick! It is the very best summer menu idea, yet. Sounds delish. I'm tempted to go and dig around in my fridge and make one right now!! I'll definitely have this salad in mind at the next farmers market.